One of our most asked questions is ‘What is the best camera to buy?’ It’s a question that’s impossible to answer simply. We may as well ask what’s the best car to buy, or the best place to go on holiday. The fact is that we all have different needs, tastes and budgets. The perfect camera, car or holiday for one person will be completely unsuitable for someone else. Our job is to help you to ask yourself the right questions so that we can narrow down the choice to a small selection that may be right for your needs. From there it’s down to your personal preference. These January sales, make sure you pick up the right bargain with our guide. How many pixels is enough? Many people assume than the more pixels a camera has the better, but this isn’t the case, particularly with compacts. In order to squeeze more pixels onto the same sized sensor the pixels have to be smaller. The smaller the pixel the less light it can collect, so the more its signal will have to amplified by the processor to get enough for a picture. This results in image degradation. So in fact fewer but bigger pixels is often better than more, smaller ones. DSLRs, and most Compact System Cameras, have much larger sensors than compacts, so although the same risks apply in over-populating it there’s a lot more room on the sensor to play with. The benefit of having more pixels, if done without degrading the image quality, is that bigger prints can be made, and selective crops may look better. This is especially important with higher-end DSLRs aimed at professional photographers and aspiring pros. A wedding client may want a giant canvas print for the wall, or a magazine may want to run a selective crop from an image across a double-page spread. If photography is your passion you may also be driven to achieve the finest possible image quality for its own sake. For most people though ten megapixels is more enough to get a decent A4 or even, with care, an A3 print. For £100 you can buy a good basic point and shoot compact, but as you spend more you begin to get additional benefits such as superior styling, faster operation, better image quality and more cool features. 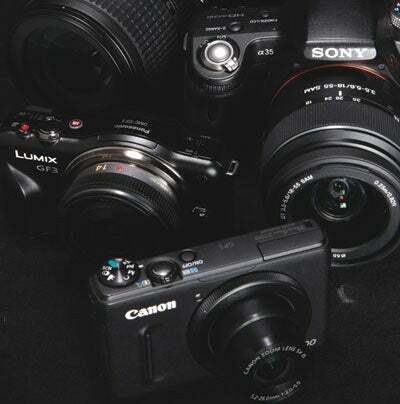 If you’re looking for a camera for creatve photography you should be looking at the top end of the compact market or a camera with interchangeable lenses. For £300 you’ll have the pick of compact and bridge cameras and for £400 even some entry-level DSLRs and CSCs will be just within reach. These can produce stunning quality pictures and lack only a few bells and whistles of their more expensive siblings. Spending more gets you higher-resolution images, faster shooting, better build quality and more fine-tuning options, but the differences get more subtle as the price increases.